Honda Odyssey Timing Belt Kit. Everything you need to properly service your timing belt. Complete kit includes only premium matched parts from Japanese OE/OEM manufacturers. These are the same parts used and trusted by Honda, Dealers and Technicians world-wide. Perfect Fit, Quality and Durability. This kit meets or exceeds original equipment specifications. All Models with 6 Cylinder / 3.5 Liter / V6. Includes The Following Brand New Parts. We also have the Hydraulic Tensioner listed here. We strongly recommend testing your current hydraulic tensioner first before ordering. These tensioners are expensive and rarely go bad, even after 250,000 miles. Save yourself a few bucks! More Timing Belt Kits Available. 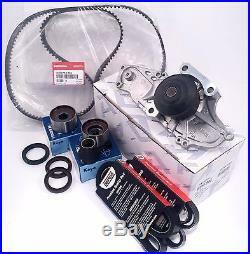 The item "Honda Odyssey Timing Belt & Water Pump Kit 1999-2001 19200-P8A-A02 H-44" is in sale since Sunday, July 25, 2010.